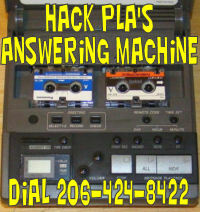 I have an AT&T telephone/answering system CL4939. Is it possible to retrieve deleted messages from it? I have been trying to find someone to do this. I don’t know where to look. I have a question and I hope you could give me an answer. So here is the example. I had an old telephone with a tape recorder answering machine. One day I got calls. My phone rang and when I picked up it just hung up. This happened several times. It seemed to me as someone was ‘testing’ my landline. The next time it rang I picked up, the line was silent, and after I hung up I got a message on the answering machine – people smiling. Could this be done by hacking or a some kind of a telephone system glitch?